Posted August 2nd, 2013 - News Posted for ISA News. Editor’s Note: My Greatest Mentors is an original series where talented folks in our global surfing community discuss the people who have made a significant impact in their approach to life – within and beyond surfing. 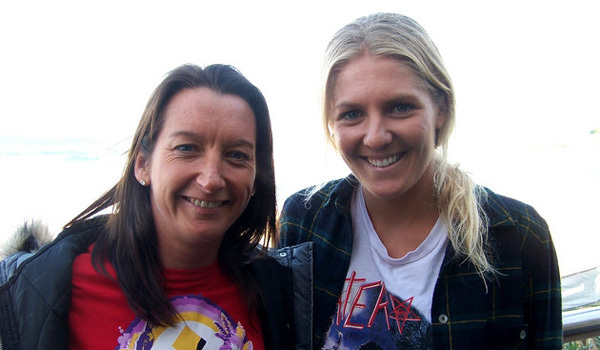 Coco Ho was the second to participate in the series and Kassia Meador was the first. Read Kassia’s piece here. When I was 8 years old, my dad told me I was adopted. It was then I decided I wanted to become a World Champion. Why? To prove my worth to the world. Surfing has and continues to be my number one passion so I feel very fortunate to have turned my passion into a lucrative professional career. Success presents us all with the opportunity to reflect. Having won seven world titles, I have an abundance of experience and extraordinary memories to draw upon, to share with others and positively influence their journey, inspiring them to fulfill their potential. Growing up in Manly (the most appropriately named beach in the world, by the way), I was very privileged to be surrounded by world champion athletes–champions that obviously possessed the knowledge, skill set and experience to achieve everything that I wanted. One valuable piece of advice I received as a young protégé is to learn from the mistakes of others–especially those that have achieved what you desire. We all tend to mold ourselves off mentors or leaders that display the kinds of values and principles that we like and wish to emulate. Pam Burridge, Wendy Botha, Barton Lynch, Tom Carroll, Martin Potter and Stuart Entwhistle were not only all World Champions, but great friends, mentors and teachers as I navigated my way onto the ASP World Tour. Out of the surfing world, I drew upon the wisdom and guidance of other champions such as World Ironman Champion Guy Leech and my personal trainer Rob Rowland-Smith. On tour, throughout my career, I also tapped into the resources of champions around me such as Pauline Menzcer, Lisa Anderson and Kelly Slater. I have always been motivated to be the best, but you are only as successful as the people you are surrounded by. This inspired me to establish a team that is made up of individuals who are successful, honest, passionate, humble and modest. Having a clearly defined set of personal values enables you to guide your decisions and influence your behaviors, ultimately controlling your destiny. All great leaders have stood on the shoulders of others and I can confidently proclaim that I would not be where I am today without the shoulders of my team of mentors and coaches. My personal trainers, surf coaches, life coaches, naturopaths, nutritionists, previous world champions and the abundance of reinforcement I have received have enabled me to achieve my dream of becoming a World Champion and rewriting the history books. Great coaches take you to places where you can’t take yourself, re-establishing and extending your comfort zone. They always see potential in you, providing positive feedback and constructive criticism. They customize their approach and openly and honestly share their wisdom with you. Ultimately, they are integral to achieving sustainable success as an individual, team or organization. I am eternally grateful to all of the people who have contributed to my success. Those who believed in me, supported me and encouraged me made it so much easier to endure the setbacks, challenges and disappointments. Just as important, they were always there to share in the triumphs, victories and celebrations. I wasn’t born a World Champion nor was I born with the ability to become one. Through hard work, motivation, determination and an inspiring team of mentors, I have come to realize that the only limitations in life are the ones we place on ourselves.